Wrong Calculations – Why Does Excel Show a Wrong Result? 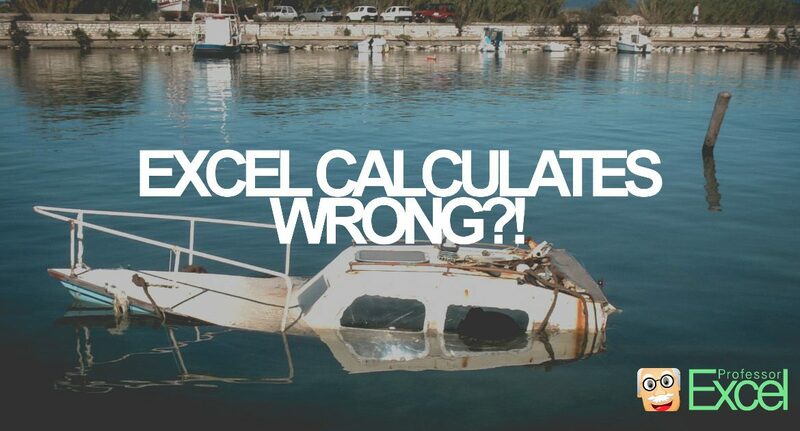 Excel calculates wrong. Yes, in some cases, Excel will return wrong results. You don’t believe me? 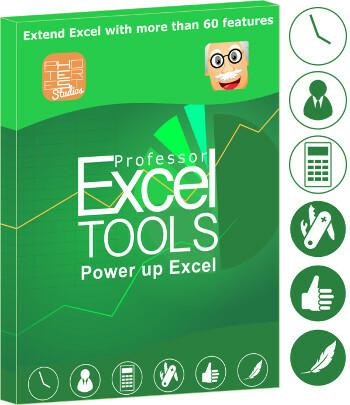 Then type the following formula into an empty Excel cell: =1*(0.5-0.4-0.1). The result should be 0. 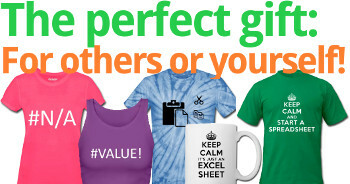 But what does Excel show? -2,77556E-17. This is just a simple example, but when it comes to larger Excel models it can be quite annoying. Especially if you want to compare the result – let’s say you want to check the result with an IF-formula if it equals 0. So what is the reason for these obviously wrong calculations and how to solve it? What is the reason for wrong result in Excel? Well, admittedly the deviation from the correct result is quite small. So in many cases you won’t even bother. The reason is quite ‘technical’: According to Microsoft, the reason for this wrong result is the so-called binary format which the numbers are converted to for calculation (more info on Wikipedia). In order to avoid an endless number, Excel would round it at the end. But this rounding of the binary equivalent to 0.1 leads to miscalculation. We round for 10 decimals. No. 3 in above picture shows an example of how to apply the ROUND formula. 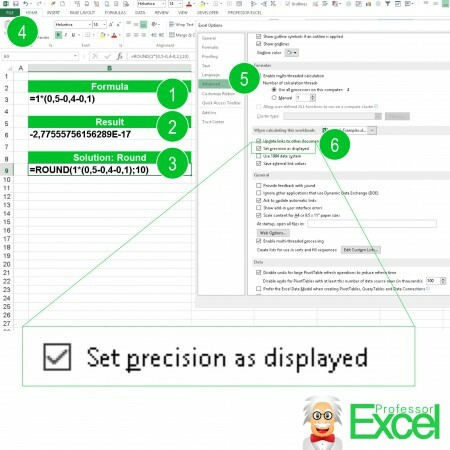 Set the precision as displayed: That would mean, that Excel only calculates as good (or bad) as the numbers are shown on the screen. Go to File (no. 4), click on Options and then on Advanced on the left hand side (no. 5). Scroll down to ‘Set precision as displayed’ (no. 6) and set the tick. Confirm with OK. So which option should you go for? The second options (setting the precision as displayed) seems easier. But be careful: This can lead to wrong results as well. On the other hand, ROUND is quite troublesome to implement. So I recommend going with ROUND if you are willing to do the effort. Changing the precision of the calculation should be last resort. 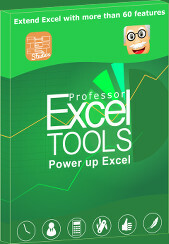 Click on the ROUND button in the Professor Excel ribbon. 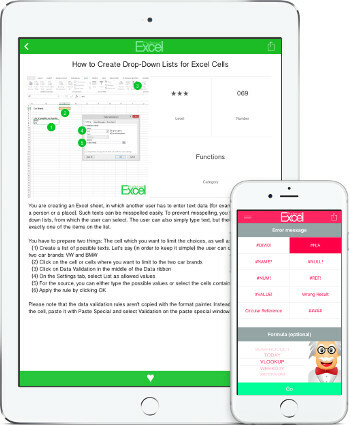 Set the number of decimals and click OK.
You can select as many cells as you like and insert the ROUND formula to all of them at the same time. I have been using Excel for roughly 20 years. I have a degree in electrical engineering so I can handle pretty much any math needed in Excel. I am doing what is known as loss development. Essentially I need to get the precise number of years between two dates. Precise, even fractionally precise. I figured Excel’s YEARFRAC function did this. It doesn’t. For example =YEARFRAC(“8/1/2011″,”7/31/2012”) and =YEARFRAC(“8/1/2011″,”8/1/2012”) both return precisely 1.00000 as the answer (absolutely identical results, verified using =(A2=B2) where the results of the YEARFRAC formulas are stored in A2 and B2). Frustrating! I had a different calculation problem. I was subtracting a cell that was the calculated sum of expenses from a cell that was the calculated sum of income. Excel gave me a result of $0, even though there was a difference between income and expenses. What fixed the problem was deleting the formula in the calculated expenses cell and then re-entering it. The new formula was exactly the same, so I have no idea why Excel didn’t come up with the right answer the first time. Good thing it was an error that was easy to catch. This was help me to save my time. Thank you for tuto. Cheers. When I am using RIGHT or LEFT formula, i am getting incorrect results. I also set the formatting on date, however nothing is working for me. This is such a big help! Thank you so much.